Renewable and hybrid energy mini-grids have emerged as a game changer for rapid, cost-effective and high-quality electrification in rural Africa. The IEA estimates that mini-grids can supply 50% of the rural energy-poor by 2030. Mini-grids involve small-scale electricity generation (10 kW to 10 MW) which serves a limited number of consumers via a distribution grid that can operate in isolation from the national transmission networks. Mini-grid systems are a viable solution for rural electrification, whenever the costs of mini-grid deployment are lower than for the extension of the national grid or stand-alone systems. 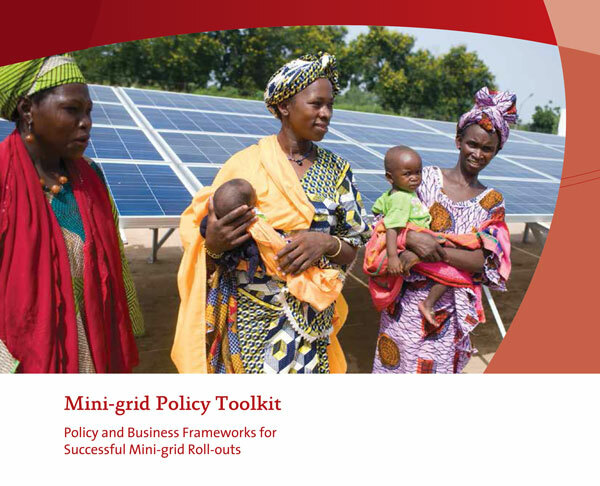 The Mini-grid Policy Toolkit is primarily written for policy-makers with the objective of enabling scale-up of mini-grids beyond a few pilot projects. In addition, the information contained in this Toolkit is also relevant for policy-makers on other continents, as well as development banks and donor agencies seeking to support and advocate mini-grid policies. It opens up the discussion of mini-grids deployment for rural electrification from a business point of view. It does this by creating a horizontal link between the different operator models and the respective financial issues and required policies and regulations. The presented operator models (utility, private, community and hybrid operator model) differ in terms of who owns the power generation and distribution assets, who operates and maintains the system and the customer relationship. The Toolkit subsequently presents all elements required for a sound mini-grids policy and regulatory framework. It breaks down the framework to specific policy instruments such as energy and electricity policy, economic and fiscal policy, licenses and contract regulations, financial support schemes as well as technical assistance and splits them into; essential and supportive, depending on the relevance they have for the adopted operator model.